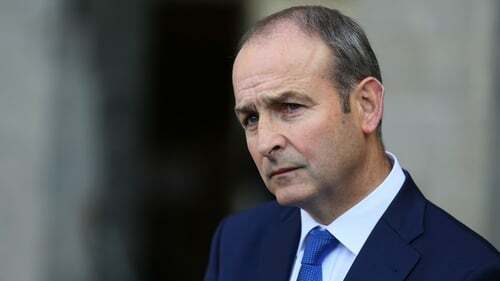 Fianna Fáil leader Micheál Martin has hit out at the UK government over its handling of the Brexit process and reiterated calls for Northern Ireland to become a special economic zone. Mr Martin made the comments at an annual MacGill Summer School event in Co Donegal. During his speech, Mr Martin accused the Government of helping to "dramatise" the debate surrounding the backstop arrangement. "Today's Tory Party is beyond satire and has long ceased to be amusing," he said. He added that the moment of truth on Brexit and Northern Ireland has been reached. "The choices facing us are starker than ever, the room for manoeuvre is becoming narrower by the day - there is no more time for delay," Mr Martin said. He also addressed the issues around the border and what he described as the "irreconcilable demands" of having no checks between the east and west. "Clearly we have to look for an approach which overcomes the fears of a constitutional sleight-of-hand created by the ridiculous and almost messianic over-spinning of the backstop last December," he said. Mr Martin said the "best opportunity" for Northern Ireland was for it to become a special economic zone. He said that Northern Ireland would benefit from the "best of both worlds", with access to both the UK and EU markets, and that special treatment would give it "in certain circumstances" a competitive advantage. Ahead of next Monday’s meeting of the British-Irish Intergovernmental Conference – the first such meeting since 2007 - Mr Martin said he hoped the meeting will mark some "major initiative" to restore Northern Ireland's institutions. "Until this happens, whatever is the Brexit outcome will lack essential democratic legitimacy," he added. "I don't want to blame the violence of recent weeks on the Brexit debate, but there is no doubt that the political vacuum in Northern Ireland is creating a dangerous climate." Sinn Féin president Mary Lou McDonald has urged EU chief negotiator Michel Barnier to push for the additional meeting of European leaders after she met with him in Brussels today. After emerging from talks with Mr Barnier this afternoon, Ms McDonald said she had received assurances that the EU was standing firm on its insistence that the ‘backstop’ agreed between Brussels and London must form part of the final withdrawal treaty. Last December the EU and UK agreed that Northern Ireland would continue to adhere to a number of European customs regulations if a wider Brexit trade deal failed to materialise. It was supposed to be a fallback position that would ensure a free-flowing border regardless of the terms of the UK's exit from the EU. However, the two sides are at loggerheads on how to translate that agreement into a legally binding commitment in a potential withdrawal treaty. Recent developments at Westminster have placed further question marks over the backstop, amid claims that Theresa May's Chequer's deal and subsequent Brexiteer-driven amendments to government legislation are incompatible with the December agreement. Ms McDonald, who was accompanied in Brussels by Sinn Féin’s leader in Northern Ireland Michelle O'Neill, said an extra EU meeting is required in September to try to forge a resolution ahead of October's crunch summit - the effective deadline to secure a Brexit deal. The Sinn Féin leader also criticised Mrs May's speech in Belfast last week, when she made clear she would not sign up to any backstop that treated Northern Ireland differently to the rest of the UK..
"The British government is seeking to row back on these commitments and to bin the December agreement. "Theresa May is placing her personal self-interest to stay in Downing Street ahead of the needs of Ireland, North and South. She added: "The EU has made clear that without the 'backstop' there will be no withdrawal agreement and that the interests of Ireland must be dealt with in line with the December agreement. "Michel Barnier assured us this remains the case and that Britain must agree workable solutions in line with the December agreement. "We believe that this must be given affect and the EU should call time on British Government stalling. "The EU should hold a special summit in advance of October to resolve Irish issues before closing on the withdrawal agreement." It comes as the Taoiseach pointed out that the Brexit "settlement" the UK agreed to in principal, are obligations and commitments that they have already made. Speaking following a meeting with the Croatian Prime Minister in Zagreb this afternoon, Leo Varadkar said any country seeking to make treaties and agreements into the future, as well as seeking to make international treaties into the future, will want to honour those obligations. He said a hard border between Northern Ireland and the Republic of Ireland could not be contemplated. "I think there is a real understanding from every member state that we need to avoid that first of all through the withdrawal treaty, and then through the final relationship," he said. The Croatian Prime Minister heavily criticised the UK over Brexit, following his meeting with the Taoiseach today. Andrej Plenkovic said it was "a lose situation" for the UK because people have realised they were "manipulated". He added that the European project had also lost out, "because we've been talking about this for the last two years". He said Croatia's priority is to see that the exit negotiations are ended in a positive atmosphere and that the interests of Ireland "are justified in the whole process, because it's important to keep what has been built in the last 20 years with the Good Friday Agreement". Tomorrow in Bucharest, Mr Varadkar will meet the president and prime minister of Romania. On Wednesday, Mr Varadkar will visit one of the most prestigious cultural institutions in the world, the Venice Biennale, which has been curated this year by two Irish architects Yvonne Farrell and Shelley McNamara. He will then travel to Rome to meet new Italian Prime Minister Giuseppe Conte on Thursday.